Wash pinto beans in a colander. Put in bowl and cover with 3 inches of water. Let sit overnight. Next morning, drain the beans. Place beans in pot and cover with 3 inches of water. Add onions, soy sauce, vegetable bouillon cubes and garlic. Bring to a boil for 5 minutes, reduce heat, cover and let simmer for 6 hours. Check occasionally and add more water when necessary. Ladle into bowls, sprinkle with cheese, and serve with freshly steamed tortillas. 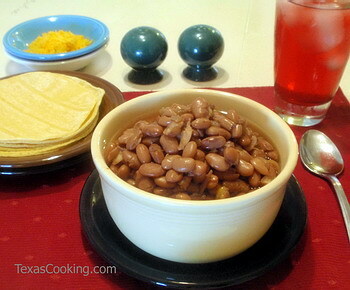 Note: Dried beans cook faster if they are soaked. Cover beans with 3 inches of water, soak them overnight, drain, and then cook according to your recipe. A shortcut to overnight soaking is to cover the beans with plenty of water, bring them to a boil and boil for 2 minutes. Then, turn off the heat, cover tightly, and let them sit for 1 hour. Then, drain and cook as usual. People in areas with hard water can cook their pinto beans till the cows come home, and the beans will still be tough or not thoroughly done. If you have that problem, add a scant 1/4 teaspoon of baking soda to the cooking water, and you will have one less problem.